Gov. Ron DeSantis met with the families of the victims of the Stoneman Douglas shooting at the Broward County Courthouse in Fort Lauderdale. DeSantis met with family members of the 17 shooting victims inside the Broward County Courthouse Wednesday afternoon to discuss the scope of the proposed grand jury. He said it would have full subpoena power to investigate how Broward and other county school districts have used funding allotted for school security measures in recent years. 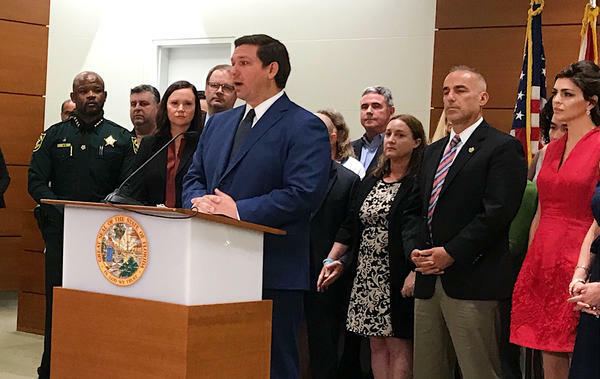 The statewide Public Safety Commission that's been investigating the shooting does have the power to subpoena witnesses, but this grand jury will be able to investigate school district practices on a bigger scale, DeSantis said. "They will be able to compel witnesses, they will be able to compile documents in a way that the Marjory Stoneman Douglas commission was just not able to do," DeSantis said. "The mandate is also broader – it's not just looking at this, but how this district and other districts have handled matters relating to school security." DeSantis said the creation of the jury is in response to calls to suspend Broward Superintendent of Schools Robert Runcie. Under Florida law, the governor cannot remove any appointed official – only those elected. DeSantis told families and reporters that he considered suspending members of the school board, who were elected, but ultimately chose not to. "It's not clear to me that having policy disputes would be a reason to exercise that power,” he said. State Attorney General Ashley Moody spoke in support of the grand jury, which would meet for one year. "I, along with every parent of school-age children in this state, expect that when we drop our children off at school in the morning we will be able to pick them up in the afternoon," she said. "I will passionately pursue the truth … and will ensure accountability for Florida's parents." The governor also signed an executive order earlier in the day, calling for an audit of diversion programs in all of Florida's 67 counties by July 1. The confessed-Parkland shooter, Nikolas Cruz, was assigned to Broward's controversial PROMISE program, but it isn't clear that he ever attended. The Governor also announced continued talks to train new Florida Department of Law Enforcement employees in a threat assessment model for mass violence. "This builds on the great work of the Marjory Stoneman Douglas Public Safety Commission," said Tony Montalto, who lost his daughter Gina in the shooting. He and other family members of the victims thanked DeSantis for petitioning for the new grand jury and working on other school security measures. "The families that lost loved ones last year have all worked hard to see some form of accountability to keep all our students and staff members safe," Montalto said.